Titanium, a refractory metal, is at least as strong as steel, but 45% lighter and won’t rust. It is twice as strong as aluminum, but only 60% heavier.Titanium keeps its strength at high temperatures, up to red-hot where steel slumps and aluminum is liquid. For artistic uses, the refraction of light through a sub-micron thickness of clear oxide on the surface produces interference pattern colors similar to the colors produced by oil on water. Read my short article about the physics of titanium coloring. Click here for a new-age, crystal-centric, pagan, or otherwise non-techie description. Discovered by: It was discovered in 1791 in its oxide form by an Englishman, William Gregor, and later rediscovered as one component of the oxide rutile and dubbed "Titanium" by the German, Heinrich Klaproth. Not commercially refined until the 1920’s. Barely used until the cold war and the space race created a demand for it. 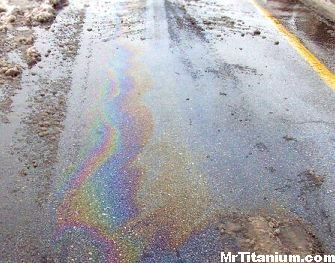 Although titanium and its colorful oxide coating are immune to time and any chemical that won't send one to an emergency room, oil and dirt can temporarily dull some of the colors. Also, abrasives can gradually wear away the surface coloring. Protect your titanium from scratches. To clean: Use alcohol or non-moisturizing soap and water and a soft cloth to gently wipe away dulling dirt and oils. Avoid metal polishes or scrubbing soaps, because these contain abrasives which may scrub away the sub-micron thick color layer.